Mindmapping is a big feature of Howard Rheingold’s course – Towards a Literacy of Cooperation. We are not only expected to collaboratively mindmap in the live sessions…. …… but also the first individual mission (task) requires the production of a mindmap. 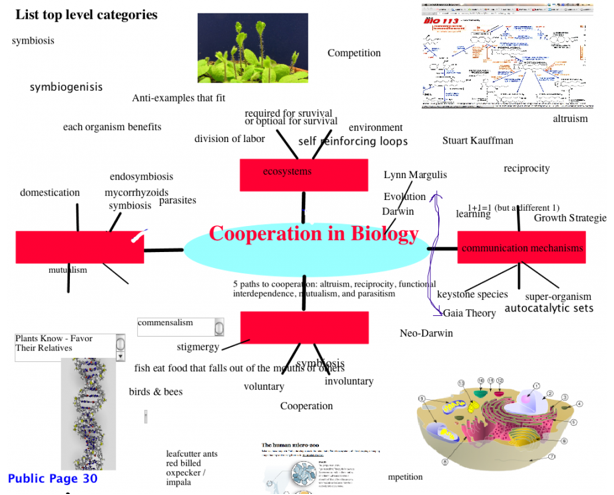 Find an example of cooperative arrangements, mutualism, complex interdependencies in biology and make a simple mindmap, post it under the Mindmaps tab. You can hand-draw, scan, and upload a .jpg or .png. Or you can use one of the many mindmapping services available, many of which afford embedding. This is a problem for me. It’s not that I don’t know anything about mindmapping or using mapping to capture information and inform thinking. I have been living with a soft systems engineer for more than 40 years, so have been aware of academics such as Peter Checkland, systems thinking, rich pictures and so on, for a long time, and have even, some time ago, attended a course run by Eli Goldratt on the Theory of Constraints to consider whether it could be applied to school education. This involved a lot of mental modelling in the form of maps. In our house if there is a complex problem to work through, a rich picture is drawn – but not by me. I have also been aware of the work of Novak on ‘learning how to learn’ for many years and have even taught concept mapping to elementary school children. I know that if you say to a six year old child – ‘If I say the word ‘plant’ what word does it make you think of?’ and the child replies hopefully with a word such as leaf, flower or root, then the next question is ‘Why did you think of that word?’ and you have the beginning of a concept map which can be drawn out initially by the adult for the child. I have seen a six year old child draw her own concept map with the support of an adult to talk her through it. Of course, rich pictures, concept maps and mindmaps are all different things. Rich pictures are akin to concept maps in that the purpose of both is to graphically depict the relationships between the concepts. Rich pictures are used for understanding complex problems. In school I used concept maps to elicit children’s understanding of the concepts. What they said about why they had connected two words would tell me a lot; a child who says plants have leaves, is at a very different level of understanding to a child who says plants need leaves for photosynthesis. Mindmaps are the tool of Howard’s choice, and some others in the course appear to be skilled at producing them. According to Howard, mindmapping is a way of breaking out of linear thinking and moving towards lateral and visual thinking. Visual mapping is certainly widely popular amongst many learners these days, with Nancy White and Giulia Forsythe immediately coming to mind. Despite all this I have never felt comfortable with any sort of mapping. I rarely get any increased understanding from looking at other people’s maps and it just isn’t the way I naturally organise my own thinking. Does this mean that I am not a lateral thinker, not an organized thinker, not a visual thinker, not a creative thinker – and if the answer to all this is ‘Yes’, does this mean I am an inferior thinker? I would like to think that we need both linear and lateral thinkers and that in any learning group there will be a mix and both will be catered for. Does lateral thinking necessarily follow from linear thinking, i.e. a step up from linear thinking, or could some lateral thinkers benefit from more linear thinking? Here is an interesting article on linear versus adaptive strategic thinking which describes how Sun Tzu recognizes the need for lateral thinking, but doesn’t reject the benefits of linear thinking.